Minimalism: Is there a formula? On one of our many forays into cyberspace, we ran across this easy to understand formula, from one of our friends Blaise Dubois. After we contacted him, he allowed us to reprint it here, for your enjoyment. Thank You Blaise! “What is the relationship between the FiveFingers, Brooks’ Pure Connect, the Nike Free 4.0 and the Adizero Hagio from Adidas? All are considered “minimalist” running shoes. However, their drop ranges from 0 to 12 mm, their thickness is between 3 and 23 mm while their respective weight and flexibility vary considerably. In my own opinion, the best definition for minimalism bears a qualitative connotation: “The least amount of shoes you can safely wear now.” Given its qualitative nature, we are bound to define tighter parameters in order to quantify the minimalist definition for running shoes. 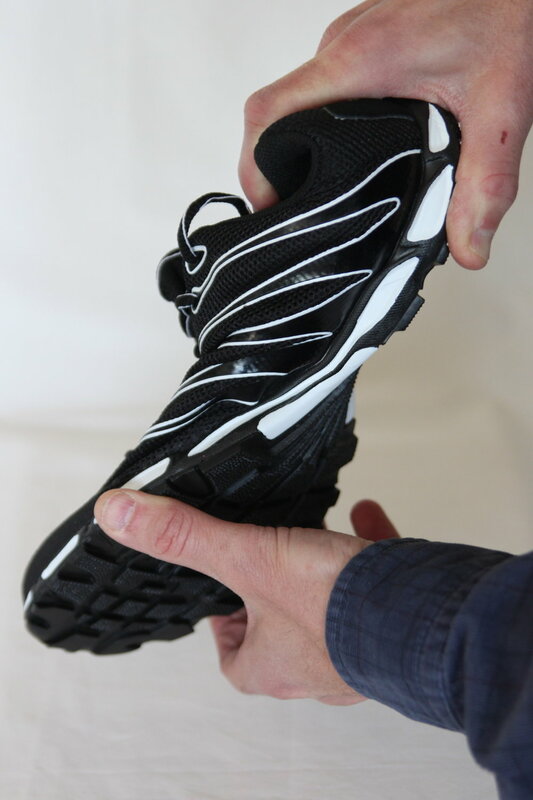 Up until now, I would have suggested the following set of characteristics for a clear definition of minimalist running shoes: a drop that was less than 5 mm (heel to toe height differential), a 15 mm stack (thickness at the heel) and a weight lower than 7 oz. (200 g). On the other hand, maximalism would have been defined based on the following: a 7 mm drop, a 20 mm stack along with a weight exceeding 9 oz. (250 g). Today, we propose a new formula so that you can rate your running shoes on a scale from 1 to 100 (100 being “extremely minimalist” -bare feet- and 1 “extremely maximalist”). The range of variation of your final rating will be more or less 5 points regardless of the comfort criteria, which is subjective. The only thing you need to do is to choose a language, then select the tab of your country at the bottom of the formula page, rate your shoes on the 6 criteria set out and there you go! Please note that we have used average values for criteria to which you don’t have the information. The multiple formats of the formula for every country are represented in accordance with their measuring system, currency and the average selling price of a running shoe for each of these countries. The Gait Guys. Bringing you the meat, the whole meat and nothing but the meat!